As an example of the kind of extremes I was referring to in my previous post, below is a chart of (NYSE New Highs - NYSE New Lows) / Total Issues. New Highs are in the top panel. News lows are in the 2nd panel. Total issues are in the 3rd and the net percentage is in the bottom panel. Over 50% net of issues hit new lows yesterday. According to my data, the last time the reading was under -50% was 10/19 and 10/20/87. Prior to that was 5/21, 5/25 and 5/26/1970, which is about as far back as my data goes. Edit: It was pointed out in the comments section that Dr. Steenbarger also noticed this. His data went back prior to 1970 and he found an additional instance. Ha! Looks like Dr. Steenbarger and I think alike sometimes! He found another day prior to 1970. 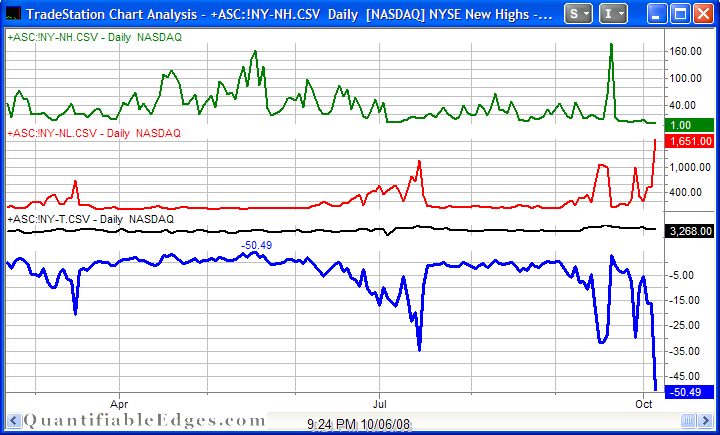 Another interesting chart is % of Nasdaq stocks above 50-DMA, at 5.6% as of Oct 7th.